The following post contain images that could be disturbing to some. Do not continue if you could not take it. Piercing the tongue has significant meaning to the devotees. According to some references, piercing the tongue disable the ability to speak, so that all the energy will be focused on honouring Lord Murugan. Some of the devotees have their tongue pierced by the swami (priest), but some hard-core devotees able to pierce on their own. I witnessed two devotees did that this morning. The most emotional part was watching the devotees on the moment when they decided to go into trance. The reason that they were doing the ‘torture’ was not for fun, but for their wishes and especially for family members. It was very touching when I saw some have tears in their eyes when they recalled the reason doing this (e.g. for the illness of parent etc.). And then within seconds, they shut their eyes and started to enter into a shallow trance. Deeper trance would later be induced by the swami. Many visitors treat the scene as amazing feat but we should go to deeper into the emotional level to understand why would someone willing to do this. I was standing so near to them inside the family circle. Hearing them chanting and cheering for each other. Some took 2 skewers (vertical + horizontal) through the mouth to make one silence of speech. The swami was very skilful and quick in action. Each pierce took few seconds. The longer one was less than a minutes because the guy has thicker tongue. 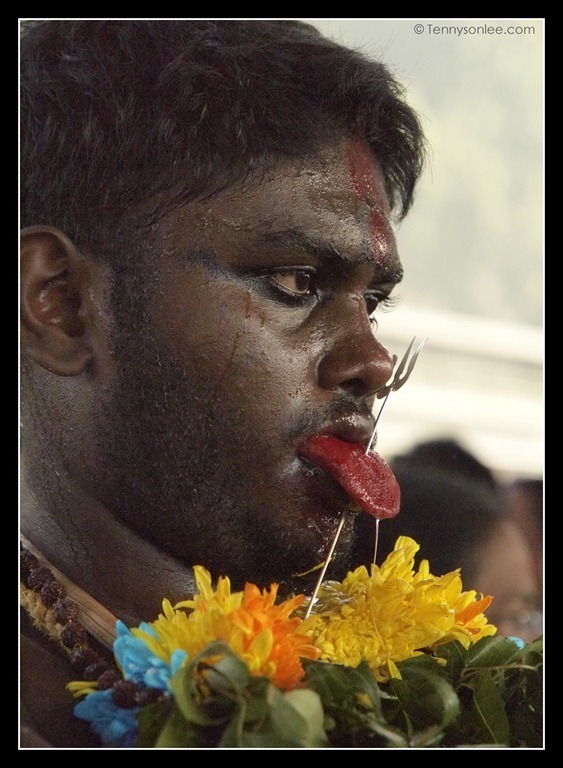 The following devotee having the pierce of his tongue inside the kavadi, making it harder (you could see many hands holding him down). This was my first time participated in the preparation. It was remarkable and emotional. Later on in another temple, I witnessed the piercing of forehead. Please bear with me on the image quality as the action took place deep inside a kavadi surrounded by a big crowd. Well. I am speechless. See you in Thaipusam 2013. This entry was posted on February 7, 2012 by Tennyson. It was filed under Malaysia, Places, Selangor and was tagged with Batu Caves, pierced, piercing, Thaipusam, tongue piercing. I’m thrilled & excited to participate in your festival. That was a close encounter I would remembered for a long time. Thank you for the great experience. Nice Shoots, thanks for posting our photos too, didn’t notice someone was actually taking our pictures. Pictures Perfect shoots. Thanks again. Hi Sara, you are very welcome. Cheers.